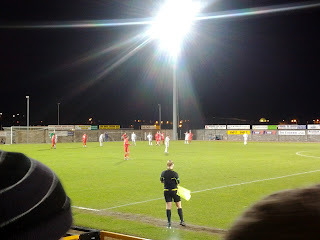 Founded in 1903, East Fife Football Club played at Bayview Park – a stadium in the centre of Methil – until 1998 when they moved to the current Bayview Stadium. Their move came after the club experienced serious financial difficulties from the 1970s onwards, only to be offered a lifeline in 1995 when property developers looked upon the town centre location of the ground favourably and consequently purchased Bayview Park in a deal that would provide the club with a modern, 2000 all-seater stadium which they proudly play in today. 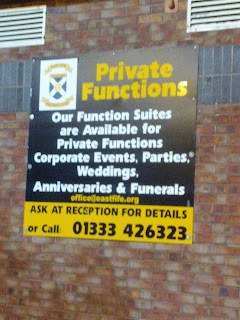 It’s not just football that goes on at East Fife though. Oh no. They have a wonderful club shop (in excellent porta-cabin fashion), offer a venue to members of the public looking to organise any event you could think of and they even have two bars. Not one, but two – Jeek Fleming's Lounge and Sid’s Bar. 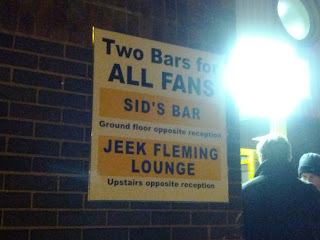 Sadly I didn’t manage to sample either but the sign (below) makes me want to head back for a shandy or two! That said, they do obviously also play football at Bayview and do it in a very nice stadium indeed. Although they only have one stand (striking similarities to Dumbarton actually) it is an extremely comfy piece of kit, very well put together and offers a good view of the entire pitch. Both ends behind the goals are empty – unless you include a 5ft wall – with a similar size wall opposite the Main Stand in front of which sit the dugouts meaning a walk across the pitch for managers and subs alike. 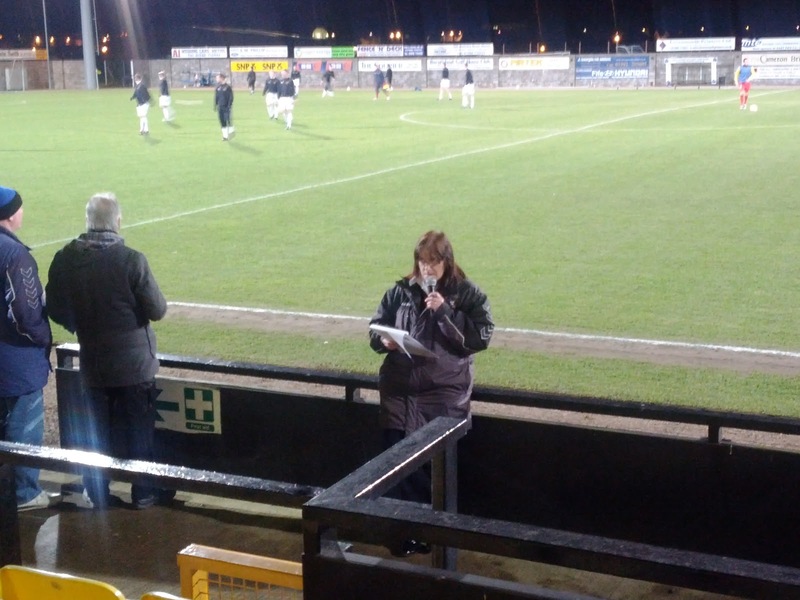 The club also offer quite a unique stadium experience in the form of an announcer with a roaming mic. I thought this was a nice touch as the announcer moved around in amongst the fans, making the standard announcements about team line-ups and social events. Considering that announcers are usually some what of a mystery, it was good to see the “voice of the balls”! 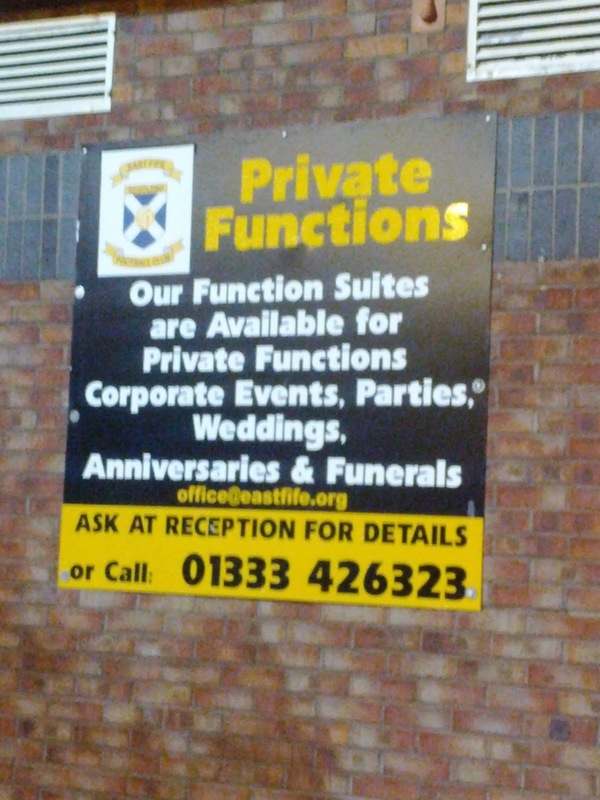 In terms of the catering at Methil, I was quite impressed. Paying only £2.20 for a pie and a tea was a rare and cheap treat and, more than that, they weren’t half bad either! Nothing particularly unique on the menu. Nothing particularly quirky or bizarre about the kiosk itself. Just a nice, pleasant and easy buying and eating experience. Ideal for football to be honest! 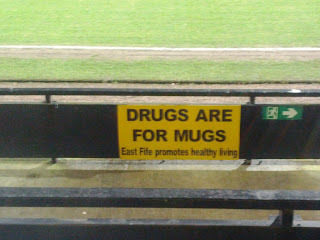 Another thing I should say of East Fife fans is that they are certainly not mugs. 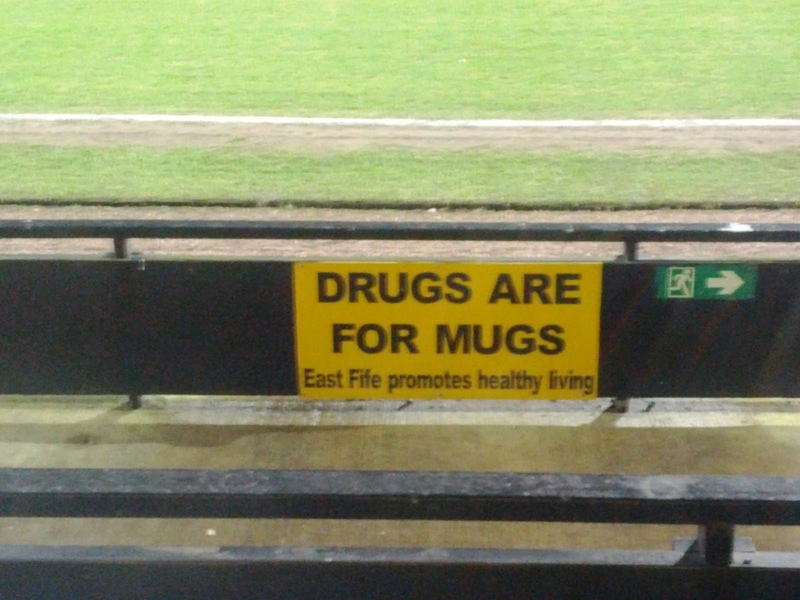 Not mugs, and no drugs because, of course………..drugs are for mugs! 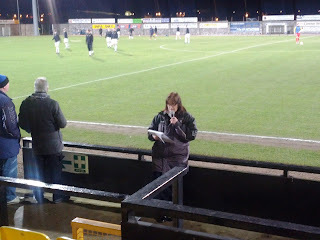 The similarities between this match and my visit to Dumbarton were striking, particularly with regard on the field entertainment. 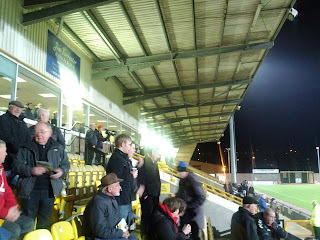 As with that day, the home side (in this case obviously East Fife) were fantastic in the first half. They were dominant across the pitch, playing some quite superb stuff at times. At the back they looked comfortable, the midfield were retaining possession exceptionally well and winning the ball back with ease and the forwards were running the visiting defence ragged. In fact, after they went in 1-0 up at half time, thanks to Bobby Linn’s well-taken strike, I was expecting more of the same in the second half. Sadly, I was to be sorely disappointed. As with Dumbarton v Arbroath in September, the away side came out all guns blazing and turned things around with a seriously impressive second half display. All the swagger and confidence of the first half seemed to disappear from East Fife as Dumbarton took control of the midfield and subsequently dominated for the remaining 45 mins, scoring twice and thoroughly deserving their win on the basis of their performance in the second period. Bobby Linn: he has a very good game, especially in the first half. Extremely skilful and with excellent spatial awareness, he was an impressive performer for the home side. He took his goal very well and was a menace at times. David Muir: Again, a good first half performer. Spraying the ball around with confidence, he seems to be a player with a lovely touch and fine range of passing. Scott Dalziel: Anyone who has read about the time I went to Stenhousemuir will know that I’m a huge fan of this boy. 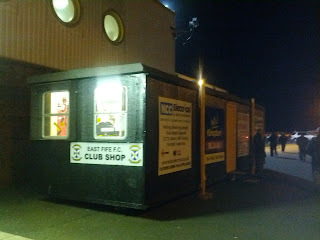 It was no surprise to me that East Fife’s attacking threat all but ended when he was hooked after 60 mins. He is a fantastic focal point for his side, takes it superbly into feet and uses the ball and space intelligently. I’m a big fan. I thoroughly enjoyed being at Bayview. For £13, East Fife proved to be excellent value for money. Their first half performance alone repaid my money and with excellent fans, good food and a comfortable stadium, I’d absolutely recommend people taking time out to visit the club. Unfortunately for the Fifers, their second half performance has cost them top spot in the Ode to the Wee Red Book supporter’s experience table. I have no doubt that even a marginally better performance in the second half would’ve seen them top Alloa. Unfortunately, they disappeared and so, while scoring highly, have fallen just…and I mean just short!